PSA. Share far and wide. I posted a video and from the comments I learned that some of us have been unknowingly living with a defect. You turn the car to ACC or ON, and immediately the engine bay gets loud since the cooling fans are running at maximum speed. To us 06+ M35 & M45 owners, especially the earlier years, it is more of a defect with the cooling fan module. Some of us have caught on to the issue and replaced the module, but I wanted to share this as a technical bulletin so we can check our cars. Why is this a problem anyway? In general, startups will increase wear on most mechanical components. You've probably heard that you should not rev your engine cold. As designed, the engine is a collection of metals that need to heat up and expand into their proper tolerances for mechanical efficiency and proper lubrication as well as proper combustion. Your car is designed for the engine to get up to that target operating temperature as fast as possible...then it fights to maintain that temperature. That is why your radiator hoses stay relatively cold for a few minutes when you start the engine. When the engine gets to temperature, the thermostat opens and allows water to flow from the radiator. At this point the radiator return hose and feed hose get closer to each other in temperature. Then it becomes a feedback system. 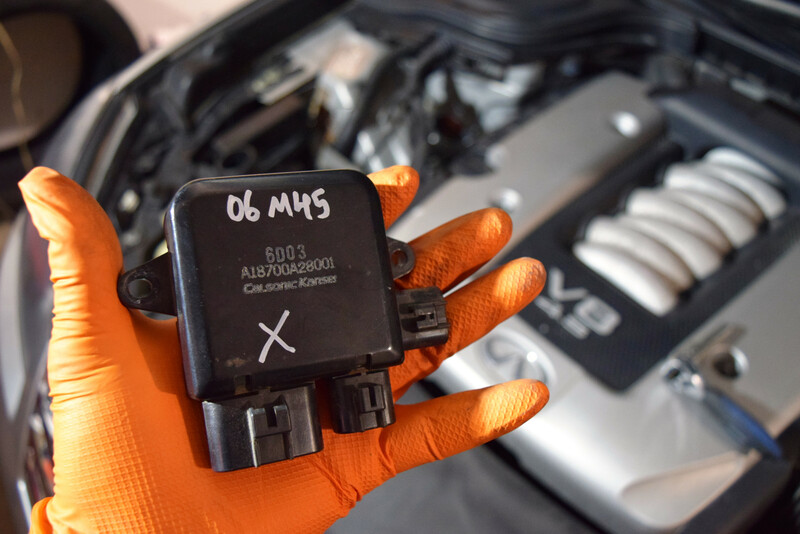 If the coolant temperature sensor says it is too hot, the ECU will trigger the fans to run. At this point, your radiator return hose is a lot cooler than your feed hose. If on the other hand, it is colder than ideal temperature, the fans stop running. Being on the highway at speed is a good example of how your radiator is cooled without necessarily involving the fans. Having your coolant fans running at max speed at startup, basically counteracts this goal of getting to temperature fast. Is it the worst thing that could happen to you? Absolutely not - it is just like starting your car up on a cold winter day. But why make your engine fight harder than it needs to to warm up? Reduce the wear and tear at startup by having the system operate as designed. As mentioned, quite a number of our cars had/have faulty fan control modules. Infiniti sort of acknowledged the issue and issued recalls, but that is VIN dependent. First thing I recommend you do is to check for open recalls for your vehicle. You can check online, but I prefer to call the dealership with your VIN number and ask if your vehicle has any open recalls. It will cost you $0 in parts and labor if the dealer repairs it. However, if your VIN is excluded from that recall, just buy another one and replace it yourself. You could gamble with a used, recent unit or just get a new one, which could could cost as low as $50 online. Aftermarket options exist too. 10 MM tools will get the job done in under 30 minutes, but beware the electrical plugs can be a little difficult to disconnect.